The advantages of building small layouts is because there is probably space for more than one and in another scale. Updates on large G scale US narrow gauge layout (previously shown issue 32). Author describes his methods for building structures. Small 0 gauge multi mode shunting layout. Lima track and interchangeable backscenes show what can be done in 80in x 8in. A very compact HO but busy micro American switching layout in three possible long or short versions, two 4ft x 1ft, one 4ft 6in x 1ft 3in. 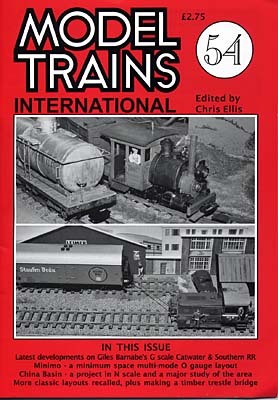 Remembering more inspirational layouts Berrow, (OO, Mac Pyrke), Drylestwhaite & Wealdsend (TT, Jim Lawton), Torpoint (O, John Harrison), Rye & Camber (OO, J Joyce), Aix-Les-Pains (HOe, Ian Jowett), Wingham Light Railway (O, Derek Featherstone). Adding to the Hornby 'Strawson' warehouse. Trestle bridges add to the scene American or elsewhere, and are not difficult to scratch build as the author shows how. A proposed elaborate N scale Santa Fe layout set in San Francisco Bay area, with information on operating and working.